I've never been so hot in my life. 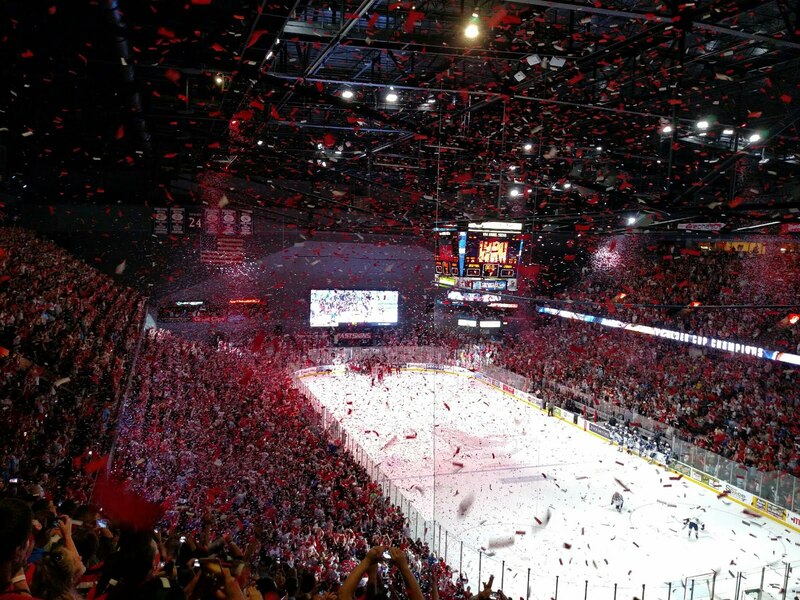 Grand Rapids beat Syracuse 4-3 and won the Calder Cup. What I'll remember the game for, though, is not the Calder Cup. I will remember that I have never felt so hot in my life. As soon as we walked in, I was struck by how warm it was. I just had on regular jeans and a short sleeve shirt, and I sweated during the game. At length. Not kidding, it had to be mid eighties or higher. Plus the humidity was off the charts. I've been in high school gyms in summer that felt cooler. Grand Rapids had a high temperature of 93 on Monday and it was almost 90 on Tuesday, and I'm sure there's no kind of cooling capacity for those temps. I can only guess that it was probably the worst ice in history. Ice can't be hard in those temperatures, and soft ice is a disaster for skilled players. Remember the Celtics-Lakers series in the mid 80s? Boston Garden wasn't air conditioned, and I remember one Finals series in particular when it was over 90 in Boston. Ah, here you go: In '84, it was hot stuff. It was 97 degrees inside Boston Garden at tipoff. One referee didn't make it past halftime, a victim of dehydration. Everyone had leg cramps. At least I didn't cramp up.